Good ‘ol Steve Jobs announced a new version of iTunes today, the music software so ubiquitous that using anything else would seem….exotic. 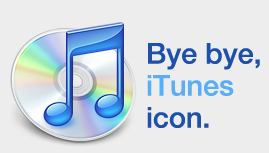 With that announcement came the expiration of the old icon, which indeed featured a CD in the background, a product we use less and less these days. Also announced was iTunes Ping, a “social network for your music”. It allows for ‘followers’, and ways to share opinions on music and upcoming concerts, all while beautifully and craftily enticing you to purchase more music. This is obviously in response to players like Pandora, Last.Fm and the like, and comes on the heels of Apple purchasing Lala last year. If any of you start using iTunes Ping, what do you think of it? Has it been well thought-out? Will it replace some of the music websites you visit?